The School also acted as another important unifying force among the ruling elite, instilling in their children common principles, attitudes and values, as well as a shared vision. No school in Hawai‘i has ever produced so many Hawaiian leaders in one generation. In addition, the following royal family members were taught there: Princess Bernice Pauahi Bishop, Princess Elizabeth Kekaaniau Pratt, Prince Moses Kekuaiwa, Princess Jane Loeau Jasper, Princess Victoria Kamāmalu, Prince Peter Young Kaeo, Prince William Pitt Kīnaʻu, Princess Abigail Maheha, Prince James Kaliokalani and Princess Mary Polly Paʻaʻāina. They ranged upon entry from age two to eleven, and differed widely in their temperaments and abilities, goals and destinies. But they all had one common bond: their genealogical sanctity and mana as Aliʻi-born. 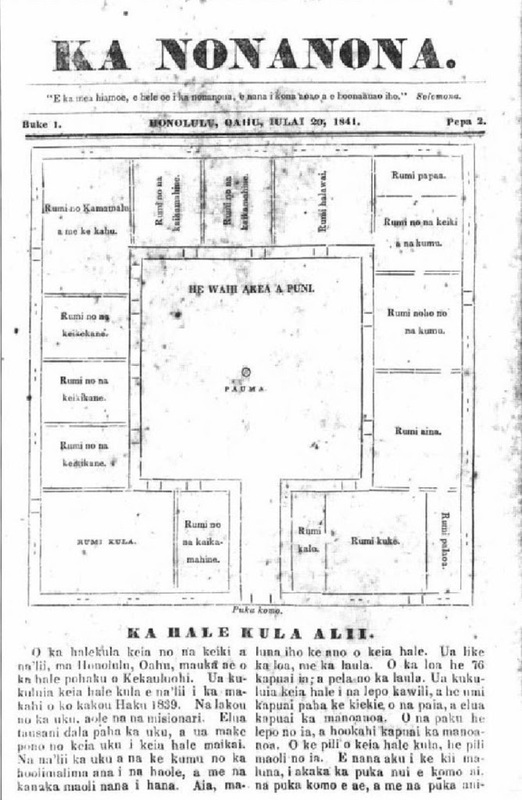 The school building was square-shaped, about seventy-six square feet in area, with a courtyard in the center and a well. The thirteen or so rooms included a large classroom, kitchen, dining room, sitting room and parlor, and living quarters for the students and the Cookes. The entire complex was surrounded by a high wall, apparently intended as much to keep people out as to keep them in. In 1846 the name was officially changed to Royal School; attendance was restricted to descendants of the royal line and heirs of the chiefs. In 1850, a second school was built on the site of the present Royal School; it was opened to the general public in 1851. In 1904, a two-story building was constructed and, in 1967, the present school was built. A new administration/library building was erected in 2000. Today, Royal School is centrally located at 1519 Queen Emma Street (you drive by it as you go down Punchbowl Street as you come off the freeway.) The student body is made up of over 350 students. Royal School truly has a proud past, as illustrated through the words of its school song: We are Na Ali’i of Royal School; We have a rich and royal past.